This entry was posted on April 6, 2014 by Tintean Editorial Team/fdg, in Book review, Fiction, History, Of Literary Interest and tagged Irish soldiers in WWI, RIC, Sebastian Barry. Bookmark the permalink. 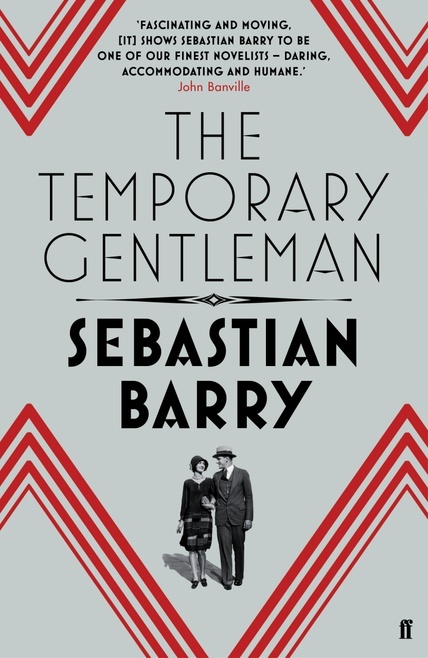 Sebastian Barry: The Temporary Gentleman, Faber & Faber, London, 2014. ISBN: 9780571276950 RRP: £18 (hardback); kindle edition available. It is only in recent years that recognition has been given to the many Irishmen who lost their lives in the Great War. Some years back, Ray Basset, then First Secretary at the Irish Embassy in Canberra (currently the Irish Ambassador to Canada) spoke to the local Cairde na hÉireann group on these forgotten soldiers as, in later times, did Ulster-born historian Richard Reid for whom the subject had a personal family connection. Credit has been slow in coming, however, as it has for the members of the Royal Irish Constabulary, the RIC. These were Irishmen who found themselves in the sights of the guns of their fellow countrymen in the War of Independence. That they should now have some belated credit to counter what is usually given to people like Tom Barry, Dan Breen and Charlie Burgess is no more than what is proper. One writer who in his plays and novels has put a powerful case for the rehabilitation of both groups is Sebastian Barry. It is unlikely that Australia will see productions of The Steward of Christendom or Our Lady of Sligo, both of which have had successful runs in London and New York, but at least we can access his novels. In The Whereabouts of Eneas McNulty, the eponymous central character is a lifelong wanderer, driven from his home town of Sligo after returning from service with the merchant marine in the Great War. The new nationalist elite do not welcome him and he finds himself even more offside when he joins the RIC. Under sentence of death from his fellow countrymen, he sets off to wander the world, returning infrequently and furtively to his native town, only to discover on each occasion that the masters of the new orthodoxy have not forgotten his former avocations. The action of the book is contemporary. Roseanne, now a centenarian ‘only a thing left over, a remnant woman’ writes the record of her life in old copybooks and hides them under loose floorboards in her room in the Roscommon mental hospital. Her father was an RIC man, though she seems to have written that out of her mind and she is the victim of that happenstance as of the too-eager ministrations of the local priest. Her narrative appears in alternate chapters with the thoughts of her psychiatrist Dr Grene who has the unwelcome duty of deciding whether she and other similarly institutionalised people should be returned ‘to the community’ in today’s brave new world of Irish, user-pays Thatcherism. Between those two books came A Long Long Way, the title obviously derived from the song favoured by the Tommies who went to their deaths remembering Tipperary – not the Irish county, by the way, but a euphemism for a region of temporary paid relief for young men in early-century London.Unlike the other two books, this one is set in Dublin around the time of the Rising. The central character has the quintessentially Dublin name of Willie Dunne. Like many young men all over the old Empire, he eagerly signs up for service to defend poor Belgium and its reputedly much violated nuns against the Bosch. His father is superintendent in the Dublin Metropolitan Police, the DMP, the group who represented law and order in the city in those times. He is tormented by the harshness that his men had to use against Jim Larkin’s strikers in 1913, but does not tell his son that four strikers had been killed in that confrontation.That book was a finalist for the 2005 Man Booker Prize (won by John Banville’s The Sea) as The Secret Scripture was for the 2008 Prize; the latter book is currently being filmed with Johnathan Rhys Myers and Vanessa Redgrave. In Barry’s latest book The Temporary Gentleman, we are back again with the fictional McNulty family. This is the story of Jack, brother of Eneas and Tom, in many ways one of life’s losers. Temporarily landlocked in Accra on the coast of Ghana, he sets down the story of his life as he remembers it. He tries to be honest with himself, but a reader can never wander far from the suspicion that we are getting his version. He does not try to exonerate himself from his many weaknesses or cover up his own failings, but we are given only a little insight into how those are viewed by the people who love him. He met the beautiful Mai Kirwan when they were both students in University College Galway. She was warned by her much-loved father that she should walk away from Jack, that although he is a qualified engineer, he is a disaster waiting to happen. In that estimate, he was tragically right. Jack, who was in the merchant navy as a teenager during the First World War, joins the British army as an officer in the second conflict, retiring with the rank of Major. He serves in Africa, Burmah, Pakistan and as a bomb disposal expert on the home front. This is the origin of the designation of gentleman, assigned on a temporary basis while the war is in progress. Unlike the story of his older brother Eneas, he seems to have attracted little distress from the new ultra-nationalist overlords of mid-century Ireland. Jack’s main problem, however, is his drinking and the way that his wife Mai, who never drank when they first met or in the early days of their marriage, quickly goes down the same path. That he is the reason for this transformation is obvious to the reader, but is something that rarely occurs to Jack. The ending is predictable but no less distressing for that. It is rare to find a story narrated by someone who is such a deeply flawed character, someone without much in the way of understanding of others. Even his act of joining the army is due less to heroism or patriotism than as a way to escape from his marriage. His two daughters, Maggie and Ursula, are background figures whose lives give hints of future trouble, perhaps to be the subjects of further Barry fictionalisation. The Irish Times has declared Sebastian Barry ‘arguably, our greatest living writer.’ Think Colm Toibin, Colum McCann, Patrick McCabe, John Boyne, John Banville, Emma Donoghue, Joseph O’Connor … and you might consider that though the claim is not without justification, the leading adverb is well employed. Frank O’Shea is a freelance writer; he has recently moved from Canberra to Melbourne.